Liz Warren has done it again. The fake-as-a-three-dollar-bill collectivist Massachusetts Senator who invited criticism and opprobrium for claiming she was a “Native American” on a job application for Harvard, and then received more criticism for years of resistance to requests for her to back it up... The woman who, when she did finally take a blood test, was shown to be 1/1024th connected to a genetic line that could be American Indian, but could also be Meso-American... 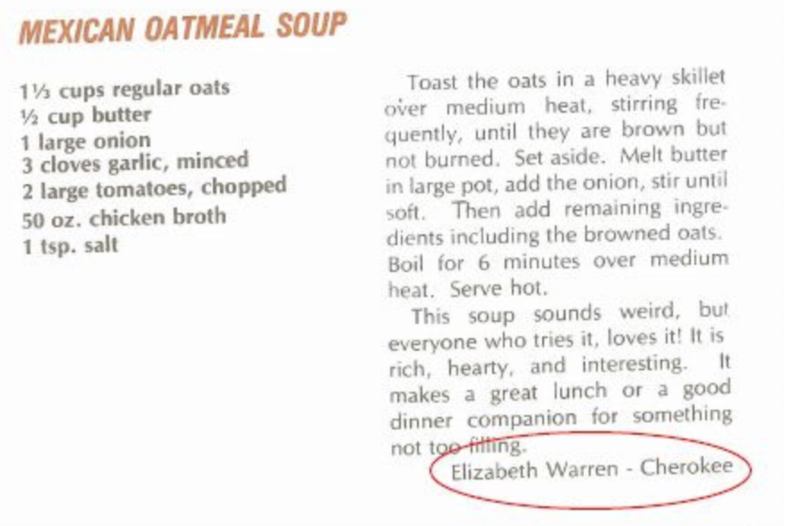 The woman who portrayed herself as “Cherokee” in a cookbook called “Pow Wow Chow”, then was (very plausibly) accused of plagiarizing two recipes... The woman who recently went live online to offer viewers a stuffy, uncomfortable “in my kitchen chat” in preparation for what might be a Presidential run… The woman whose ancestor Breitbart has revealed actually served in the Tennessee militia that rounded up Indians for the Trail of Tears death march... She is in the news again. This time, for something else she didn’t tell us, and which has gone viral across the web. The State Bar document, which functions as a kind of directory entry for lawyers, is among multiple instances in which Warren described herself as a Native American. She indicated that she was Cherokee in an Oklahoma cookbook called " Pow Wow Chow" in 1984, and listed herself as a minority in the Association of American Law Schools Directory of Faculty from 1986 to 1995 -- a move she said later was an effort to "connect" with other “people like me." Those people would be… Folks one could reasonably assume were not Native American? Or would those be folks who were limited in their capacity to tell the truth? Or, perhaps those would be people who appear to have tried to use race-based preferences and prejudging for their own professional gain? Whichever it is, Paul Steinhauser reports for Fox News that the Republican National Committee has filed a grievance with the Texas Bar Association, asking for “disciplinary action” to be taken against her for making “false claims” about her race, and for not correcting it over the course of 33 years. Perhaps Liz will need more than one of those beers she “spontaneously” grabbed during her cardboardesque kitchen livestream in order to “chill” after making such a mess of her reputation. Then again, such a prospect is unlikely for a creature who has displayed such a monumental lack of shame. Heck, if she did "grab some beers", she might try to lay claim to something tied to the beer company. Let’s hope that she doesn't start pulling Narragansetts from the fridge.